For most of us, our dogs are part of the family. In which case, we want to make sure they are getting fed as well as we are, too, because we want them happy and healthy. This means feeding them puppy chow when they’re young, switching to adult dog food, and finally, changing it to dog food for seniors. First of all, it needs to be noted that not all dogs age the same; it actually depends on the breed, body weight, and health. Larger dogs will reach maturity well before smaller dogs, so you need to make sure you talk to your vet regularly. Change your dog’s food if and when the time is right. Some dogs can remain on adult dog food longer than others. If you want to know when a dog has reached his golden years, just divide his life expectancy in half. If your dog is expected to live 15 years, then he’s starting over the hill when he reaches 7-8 years old. This may come as a surprise to many of you. Most people think it’s just the last few years when dogs are considered seniors, but it’s much earlier than that. Their oldest years are called geriatric and you may need to change your dog’s food then as well. You need to talk to your vet about your dog’s age and nutritional needs. As dogs age, their stamina and metabolism slows down and their health starts to decline. Senior dog foods can help your dog to live happier, healthier lives and maybe even longer ones by keeping them in shape, not allowing them to get overweight, and giving them the right nutrition. Since your dog’s eating habits and dietary needs change as he gets older, you’ll need to change what you feed him. Make sure not to make a decision without the advice of your vet. Wellness Complete Health Senior contains nutrient-rich, naturally-sourced ingredients which provide the essential diet needed by aging dogs. The recipe for this tasty dog food can make your mouth water, including chicken, white fish, brown rice, carrots and other vegetables, barley, oatmeal, flax seed, and canola oil. This food for senior dogs is formulated to help strengthen bones and joints, improve body mass, and improve digestion. 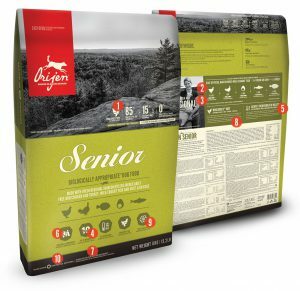 Orijen Dog Food for senior dogs is excellent for older dogs who have lost interest in eating; they will be enticed by the smell and keep eating it for its taste. The tasty ingredients for this dog food blend is chicken, turkey, eggs, fish, fruit, vegetables, and other sources of required nutrients and minerals. This dog food is formulated for the aging pup by being packed with high quality protein which helps aid his now less-efficient metabolism. 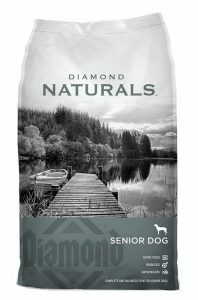 Diamond Naturals Dry Food for Seniors is essentially designed for your dog’s golden years and will help him attain optimal health. Nutritionally balanced, this dog food is packed with protein, fat, antioxidants, and mineral sources. The delicious recipe contains chicken, brown rice, eggs, oatmeal, beets, fruits, and vegetables. This senior dog food may help keep your dog active and well-nourished. Whichever senior dog food you choose, make sure to talk it over with your vet first. Not only do you need to make sure it’s the right time, but you also need to make sure you get what’s right for your dog. Every dog is different. Help keep your dog a part of the family longer by keeping his vet visits up to date.